Another Youth Theatre Ensemble Performance!! ‘Where is Kick?’ is a Caribbean play written and directed by Luci Hammons. Set in Barbados in present time, the play tackles issues of adolescent mental illness, and its perception throughout society. Themes such as friendship, personal isolation, prejudice, love and survival are used to aid in an in-depth exploration of the story. 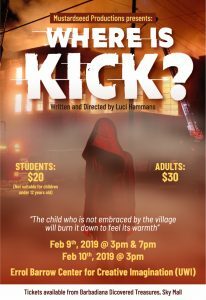 The story is surrounded around ‘Kick’, a strong headed troubled student who has found herself in a situation that threatens her future, and those around her. Her close friends become an anchor in her life. Through the use of flashbacks, rhythm and movement, the painful journey, which Kick has travelled is explored, and show where responsibility lies. ← AUDITIONS AND CASTING CALL!